Amy Glaza, CISR has been with the agency since June 2013. 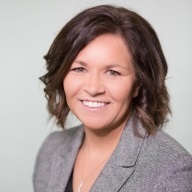 She is licensed in personal lines insurance and holds a Bachelor's of Science Degree in Communications from Southern Illinois University, Edwardsville. She earned the Certified Insurance Service Representative (CISR) designation in June 2018. This is nationally recognized as an important credential for insurance agents, benefiting her agency and clients. Amy enjoys spending time with her husband, two children, and golden retriever, working out, and cheering on the Chicago Bears, Chicago Cubs, and the St. Louis Blues!